In Traditional Chinese Medicine the concept of Qi is used primarily in two ways. The first is to describe the activities of bodily organ. For example, Heart-Qi indicates the complex of the functional activities of the Heart, such as governing the Blood, controlling the Blood vessels, etc. Thus, there is Liver-Qi, Heart-Qi, Lung-Qi, etc. In a sense, it is also used to indicate disorders of the organ's function – for example, "Qi Bi" (Qi constipation) and "Qi Liu" (Qi tumor). The second use of Qi is to describe vital energy. 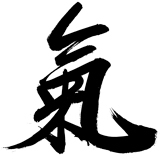 This is better understood from the Chinese character for Qi (氣) which is composed of two radicals: "vapor, steam or gas" and (uncooked) "rice" or grain. This implies that Qi can be as immaterial as vapor, or as dense and material as rice. It also implies that Qi could be just a subtle substance (vapor) produced from a coarse one (rice), just as cooking rice produces steam. Thus, sinologists generally agree that Qi is the energetic foundation of the universe, analogous to the matter-energy theoretical constructs of modern physics. Qi is the physical and spiritual substratum of all human life. In Chinese medicine, the terminology employed depends on the state of the energy-matter. Energetic material, ranging from less dense to denser, is termed: Spirit (Shen 神), Energy (Qi 氣), Essence (Jing 精), Blood (Xue 血), Body Fluids (Jin Ye 津液), Marrow (Sui 髓), and Bone (Gu 骨). The three most important energetic substances for the function of the body are Jing, Qi and Shen, representing different stages or phases of life phenomenon. These are known as the "Three Treasures" or "San Bao" (三宝). Jing and Qi are the material foundation for Shen (Mind) — This postulate is used in Chinese medicine because Jing, Qi and Shen represent three different states of the condensation of "Qi", from coarse, to rarified, to subtle and immaterial, respectively. If Jing and Qi are healthy and plentiful, the Mind will be happy. If both Jing and Qi are deficient, the Mind will suffer. The simplest definition of the "Jing" is "essence." Its Chinese character (精) implies that it is a refined substance derived from a coarser one. In many senses, Jing could be the internal sources or structure base of Qi. Jing itself can be divided into different types or be looked from different angles. If Qi is used in the sense of function, Jing would be understood as the physiological structure. If Qi is considered as vital energy, then Jing would be the physiological systems that support the energy. For example, endocrine system is frequently referred as "jing" in Traditional Chinese Medicine (TCM). Keep it in mind that there are disagreements on what can and cannot be called "Jing." 1. Prenatal Jing (Pre-Heaven Essence). At conception, Prenatal Jing passes from the parents to the embryo. This essence, together with nourishment derived from the Kidneys of the mother, nourishes the embryo and fetus during pregnancy. Prenatal Jing determines basic constitution, strength, vitality, and so individual uniqueness. Some say once inherited from the parents, Prenatal Jing cannot be altered. Prenatal Jing is conserved by balance in all life activities – moderation in diet, work/rest, and sexual activity. Irregularity or excess in these areas wastes Prenatal Jing. Certain exercises help conserve Prenatal Jing, such as Tai Chi and Qigong. Tortoise breathing may also positively influence it. 2. Postnatal Jing (Post-Heaven Essence). Postnatal Jing is the complex of essences extracted and refined from food and drink by the Spleen and Stomach. The Lung gets Qi from the air. These essences form the material basis for the functional activity of the internal organs and metabolism of the body. The Kidneys store any surplus Jing to be released when required. Postnatal Jing is continually being used by the body and replenished by food and drink. The Prenatal Jing is enriched and functions optimally only through the action of the Postnatal Jing. Without the function of the Prenatal Jing, the Postnatal Jing cannot be transformed into Qi. It is the basis for growth, development, sexual maturation, and reproduction. It moves in long, slow developmental cycles (men's Essence flows in 8-year cycles; women's in 7-years) and presides over the major phases of development in life. Kidney Jing declines naturally, producing the signs of aging, such as loss of hair and teeth, and impairment of memory. Kidney Jing because it is fluid-like may be considered as an aspect of Kidney Yin. Kidney Yin when warmed by Kidney Yang and the heat from the Ming Men produces Kidney Qi. Kidney Jing produces what is called "Marrow" in TCM — (there is no exact equivalent of this concept in western medicine). This "Marrow" produces bone marrow, as well as the brain, and fills the spinal cord. If Kidney Jing is weak, the brain may be undernourished, leading to poor memory or concentration, dizziness, a feeling of emptiness in the head, etc. Jing and Qi are the material foundation for Shen (Mind) — This postulate is used in Chinese medicine because Jing, Qi and Shen represent three different states of the condensation of "Qi", from coarse, to rarified, to subtle and immaterial, respectively. If Jing and Qi are healthy and plentiful, the Mind will be happy. If both Jing and Qi are deficient, the Mind will suffer. Yuan Qi is said to be Jing (Essence) in the form of Qi. Yuan Qi has its root in the Kidneys and spread throughout the body by the San Jiao (Triple Burner). It is the foundation of all the Yin and Yang energies of the body. Yuan Qi, like Prenatal Jing, is hereditary, fixed in quantity, but nourished by Postnatal Jing. Yuan Qi is the dynamic force that motivates the functional activity of internal organs, and is the foundation of vitality. It circulates through the body in the channels, relying on the transporting system of the San Jiao (Triple Burner). It is the basis of Kidney Qi, and dwells between the two Kidneys, at the Gate of Vitality (the Ming Men, GV-4). It facilitates transformation of Qi described below, and participates in producing Blood. Energy generated from the Spleen and Stomach, whose function is to transport the Qi from food into the chest where it is combined with the Qi of the Heart and Lungs. Food entering the Stomach is first "rotted and ripened"; then transformed into a usable form by the Spleen. The energy derived from this food essence is divided into Pure Yang Qi and Impure Yin Qi by the Spleen. The Pure Yang Qi is sent upward to the chest by the Center Qi via the Middle Burner. First, it goes to the Lungs where it combines with the Heavenly Qi to form Gathering (Zong) Qi. Then, it is transported to the Heart, where it unites with the Yuan Qi from the Kidneys to produce Blood. The turbid Yin Qi of Gu Qi is sent down by the Spleen via the Middle Burner to the Lower Burner to be further refined and excreted. This is the pure energy from the Gu Qi sent by the Spleen to the Upper Burner and chest via the Middle Burner, also known as Yang Qi. This is the impure energetic essence of Gu Qi transported by the Spleen via the Middle Burner to the Lower Burner to be further refined and excreted. The Spleen sends Gu Qi to the Lungs, where with the assistance of Yuan Qi and Kidney Qi it combines with air and transforms into Zong Qi. Zong Qi nourishes the Heart and Lungs, where it forms the basis of the pulse and respiration. If weak, the extremities, especially the hands, will be weak or cold. Zong Qi gathers in the throat and influences speech (which is under control of the Heart) and the strength of voice (under control of Lungs). It is affected by emotional problems, such as grief and sadness, which disperse the energy in the chest and weaken the Lungs. The Lungs and Kidney mutually assist each other via Zong Qi and Yuan Qi. Zong Qi flows downward to aid the Kidneys while Yuan Qi flows upward to aid in respiration (and the formation of Zong Qi). The chest area where Zong Qi collects is called the "Sea of Qi." Zong Qi and the Sea of Qi are controlled by the acupuncture point Shanzhong Ren-17. Zong Qi originates in the Lungs. It is transformed into Zhen Qi with the catalytic action of Yuan Qi. Zhen Qi is the last stage in the transformation and refinement of Qi. It is the Qi that circulates in the channels and also outside the body and nourishes the organs. Zhen Qi has two different forms, Ying Qi and Wei Qi. Ying Qi nourishes the internal organs and the whole body. It spends two hours in each channel, moving through all twelve channels in a twenty four hour period (termed the Horary Cycle). During these periods, the corresponding organs are nourished and maintained by the Ying Qi. It is closely related to Blood, and flows with Blood in the vessels as well in the channels. Ying Qi is the Qi that is activated by insertion of an acupuncture needle. It is closely related to the emotions, since it can be directed by thought. Wei Qi is fast moving, "slippery" and more Yang than Nutritive Qi. It flows primarily under the skin and in between the muscles, especially in the Tendino-Muscular meridians. Wei Qi protects the body from attack by exogenous pathogenic factors such as harsh weather conditions, microorganisms, harmful emotions, and evil spiritual forces. For example, a deficiency of Wei Qi can make someone prone to frequent colds. There are three Wei Qi fields extending several feet from the body. All energetic forms of the body, including organs, blood vessels, nervous system, etc., can be accessed and treated through these fields. Wei Qi warms, moistens, and aids in nourishing skin and muscles. For example, a person with a deficiency of Defensive Qi will tend to feel easily cold. Wei Qi adjusts the opening and closing of pores; thus, regulating sweating and the body temperature. It is controlled by the Lungs, which regulates its circulation. Deficient Wei Qi can lead to spontaneous sweating. When an exogenous pathogen (e.g., Wind-Cold) invades the exterior, the pathogen can block the pores, inhibiting the function of the Wei Qi, and blocking sweating. Defensive Qi has its root in the Lower Burner (Kidneys). It is nourished by the Middle Burner (Stomach and Spleen) and is spread outwards by the Upper Burner (Lungs). Wei Qi in the daytime circulates in the Exterior, but at night it goes into the Interior to protect the Yin Organs. It is said that sleeping under an open window at night gives exogenous pathogens a better chance for attack than during the daytime, since the Exterior of the body is less well protected. Hence, it is easier to catch a cold at night than in the daytime. Wei Qi can become thicker and extends farther out during Qigong practice. Therefore, it may take longer to move inward at night, causing some Qigong practitioners to have difficulty falling asleep after evening practice. Also is known as Righteous Qi. This is not another type of Qi but a general term to indicate the various Qi protecting the body from invasion by Xie [pathogenic] Qi. The energy from food, drink and air cultivated after birth. Postnatal Qi depends on Prenatal Qi for development. Both form the foundation for the body's vital energy. This is the energy responsible for the functioning of the internal organs. The Yang-Fu, hollow bowels, produce Qi and Blood from food and drink. The Yin-Zang, solid viscera, store vital substances. Each organ has its own energy corresponding to one of the Five-Element energies, which respond to the universal and environmental energy fields. Thinking, feeling, metabolism and hormones can influence the Organ Qi. Editor's note: the above entry was adapted from "Qi in Chinese Medicine, Part 1" and "Qi in Chinese Medicine, Part 2", by Marty Eisen, PhD and Kevin W Chen, PhD published in Yang Sheng (Nurturing Life). Dr. Jerry Alan Johnson. Chinese Medical Qigong Therapy. International Institute for Medical Qigong, Pacific Grove, 2000. See Dr. Eisen's entry "Qi in Traditional Chinese Thought."